DON’T GET STUCK ON THE BATTLEFIELD – USE THE SCEPTER! At a time when many are facing intense spiritual battles and confrontations with demonic strongholds, we must remember where our ultimate destiny is. Whether it’s warring on behalf of our nation or battling a spiritual enemy at home, the Lord wants to remind us of our greater call. We were created to live in the palace, not on the battlefield. God has equipped us as believers to be effective prayer warriors in battle. Our armor protects and guards us from the evil one (Eph 6:17). Our weapon of choice is the sword of the Spirit and it has the power to vanquish every foe (Heb 4:12). Even so, if we focus all our attention on the warfare at hand and the battles raging around us, we may forget our higher position and role in the Kingdom. We are sons and daughters of the King who have a birthright to the throne. Though there will be times of war and resisting the enemy, we must keep our eyes on the palace where our inheritance waits. Warriors do not get an inheritance, but sons and daughters do. The Adversary will do all he can to keep us distracted by picking all sorts of unnecessary fights. He knows if he can keep us from our true position with the King, he will have taken the ground destined for us. As sons and daughters, we have the right to rule because He has given us His scepter. As much as there is power in the sword of the Lord, there is just as much power in His scepter. Some battles may be won by the sword, but others will be won through the scepter. When we position ourselves as warriors on a battlefield, we will use the sword to either defend ourselves or attack the enemy. A warrior seldom stands still and is busy dealing with the enemy close up. As a result, warriors are focused on the immediate battle at hand and don’t have the advantage of a larger perspective. Their focus is on defeating an enemy, not ruling a kingdom. However, when we take our positions as sons and daughters on the throne, our perspective has changed. When we rule with a scepter in our hand, there is no need to defend OR attack. When dealing with an enemy intrusion, we do not engage in skirmishes, but simply state the Father’s purpose and will, knowing full-well our authority and right to do so. The boundaries of the kingdom have been firmly established and our role is to maintain those boundaries by decree of the King, knowing the hosts of heaven have been dispatched on our behalf (1 Pet 3:22, Rev 12:7-9). We can vanquish foes, not only by the power of the sword, but by the authority of the scepter. Knowing this, the enemy will try to engage us in needless battles in order to keep us on the battlefield and out of the palace! Both the sword and the scepter have their place. When a battle is at hand, we need to rightly discern which weapon of warfare to use. 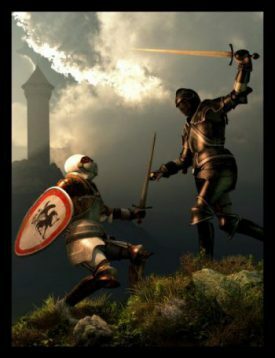 As intercessors, we do not always have to war with the sword on the battlefield. Where the sword may demonstrate our courage and faith in God, it is the scepter that will demonstrate our lasting authority as sons and daughters of an eternal Kingdom. The sword yields power for the battle, but the scepter determines the rightful heir. It is our attitude and posture of heart that will determine the difference between getting hung up IN the battle or going THROUGH the battle towards the palace. We can’t get stuck on the battlefield. There is a seat for us beside our Father on the throne and He has already extended us His scepter with which to rule in the Kingdom and expel the demonic invaders. Declare your Father’s Word as a rightful heir and defend the Kingdom from the throne. We don’t have to wait to rule until all our enemies are defeated. We have been instructed to rule right IN THE MIDST of them! The Lord Himself states that HE will make our enemies our footstool – IF we stay seated beside Him on the throne and rule. Know how to fight with the sword, but better still, learn to rule with His scepter. 5 Comments on DON’T GET STUCK ON THE BATTLEFIELD – USE THE SCEPTER! This is the scripture that came into my mind last month when I could no longer be a warrior. I was too ill to do anything. When I pondered that scripture, I clearly recalled Hebrews 11 describing those in the midst of their enemies, ruling literally by faith, seeing a kingdom that was spiritually discerned. It was a turning point for me spiritually. When I was able to read again, I had bookmarked a psalm, which was the first thing I read. I think you can guess which psalm it was. Thanks for your post. Yes our “Sword” is the Word of God – and our scepter is the “Authority” given to us when we pray/speak/declare a thing “IN THE NAME OF JESUS” it shall be so! Thank you for this wonderful message straight from the Fathers heart! We need to pray that the CHURCH gets a hold of this TRUTH! Thank you for the clarity with which you have presented this. This is such a relief to read and it’s a refreshing word and promise from Poppa. Thanks so much! !